Great idea: Let’s switch our currency to something I have a lot of! Like twisty-ties, bottle-caps (!! ), pistachio shells, glitter or small pieces of lint! Someone let me know that you can sort your Steam games into different, self-made categories and now I’m finally making steps toward organizing this backlog. I get a decent number of gifts from people through Steam, and while I do try to keep a notepad file updated with who gifted me what, I do lose track of the games themselves. I didn’t even know I had half of these. Best problem, right? I tried to pay rent with my backlog though, and much to my surprise, they don’t accept “having a lot of backlogged games on Steam”. This is why we need to fund NASA. 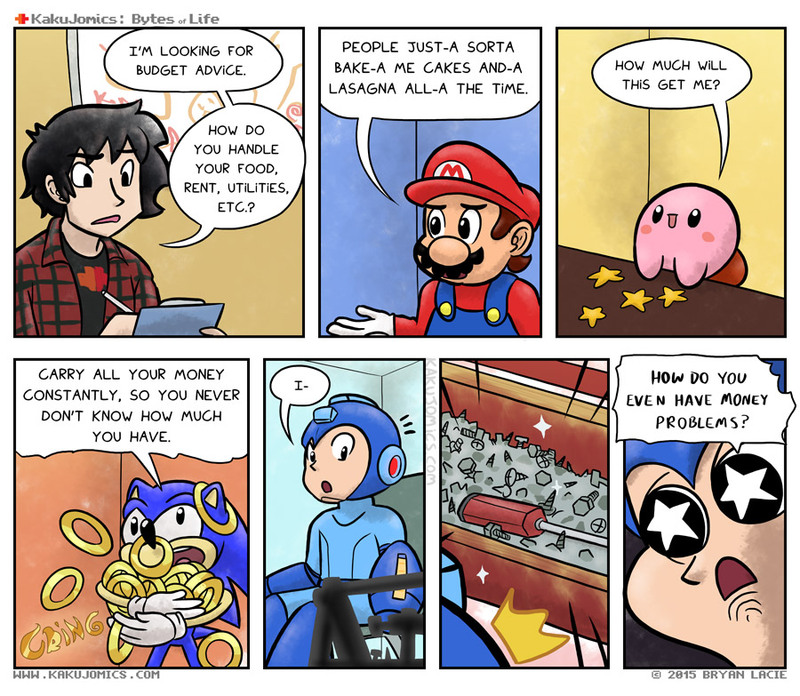 Sonic’s logic is by far the most reasonable one. If you could have ALL of your money on you that is. Link sitting in the corner, breaking Kakujo’s plant pots. “How could they not know?” Link thinks. So much soil and broken pottery. He then cuts the plants, their rupees lie within, so he thought. Poor Link, you’ve just made a mess. Link stands there, staring at his creation, his back to Kakujo and his now worried family. He turns his head. Slowly, so slowly, in till the truth is finally shown. The goddamned Cat in the Hat. Vas!! Don’t give the comic ideas away! Whats up with Megaman’s chest though? I use a little app called “Moneywise”. all I have to do is input my transactions and it does the rest for me.